The Smoketree School of desert art enjoyed its greatest flowering at the Desert Magazine art gallery on Highway 111 in Palm Desert. While the gallery is long gone, the building (it most recently housed LG’s Steakhouse) has looked much the same all these years. It’s a highly visible shrine to artists such as Jimmy Swinnerton, Olaf Wieghorst, Brownell McGrew, Bill Bender and many others. 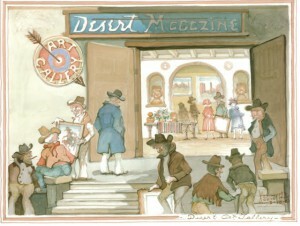 The regulars at the Desert Magazine gallery, by German artist L. Wertz. Courtesy of Anne Shelton. Now the shrine is threatened with defacement. The owner, San Diego developer Sam Rasmussen, appeared before the Palm Desert architectural review committee on July 10, 2012. The City approved his plan for a modernized facade for the building. Even though it’s not a tear-down, it might as well be as the redesign will obliterate most traces of the original magazine and gallery, replacing the Southwest style with modern glass and stone. The circa 1948 adobe-style building (technically called Pueblo Revival style) once stood alone on an empty bajada. Today, hemmed in by a modern city, it still manages to transmit the vision of magazine founder Randall Henderson—a vision of lost treasure, hidden geodes and nomadic artists. Local preservationist Janice Holmlund urged city officials to abide by CEQA (California Environmental Quality Act) rules and halt desecration of the landmark. “The Desert Magazine building is the founding block of this city,” she wrote in a memo to the council. Home of the city’s first printing company, first bank, first art gallery and first post office, the building is eligible for listing on the National Register of Historic Places. The fight is reminiscent of the recent battle to save another desert art landmark, the Carl Bray Gallery in Indian Wells. That fight was lost, despite findings of historical significance in a City-funded report. Palm Desert, like Indian Wells, is keen on presenting a shiny, modern image to tourists. 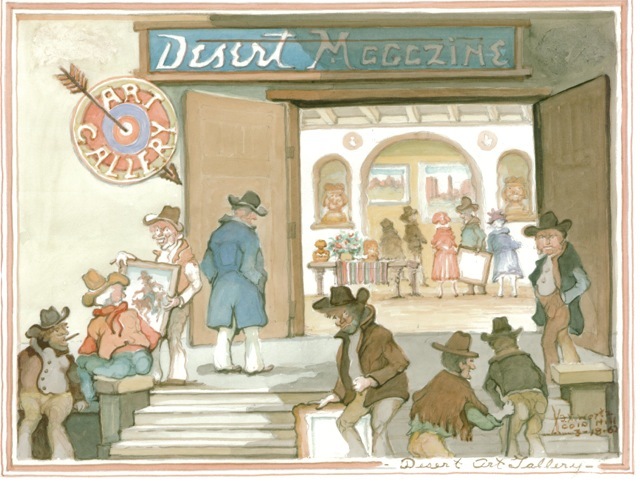 Many residents and officials have no understanding of the importance of Desert Magazine, a publication that transformed the way Americans viewed the desert, or the Desert Southwest Art Gallery, that launched a scene as important as those in Taos or Laguna Beach. If you value early desert art, please urge the Palm Desert City Council to preserve this monument. Send e-mails to info@cityofpalmdesert.org, and ask that your comments be forwarded to the City Council.